The OSEPP Motor and Servo Shield can plug directly onto the Arduino and Arduino compatible boards. It supports up to 2 servo motors and 4 bi-directional DC motors, or 2 servo motor and 2 stepper motors. Servo header and terminal blocks are provided for easy connection to motor. 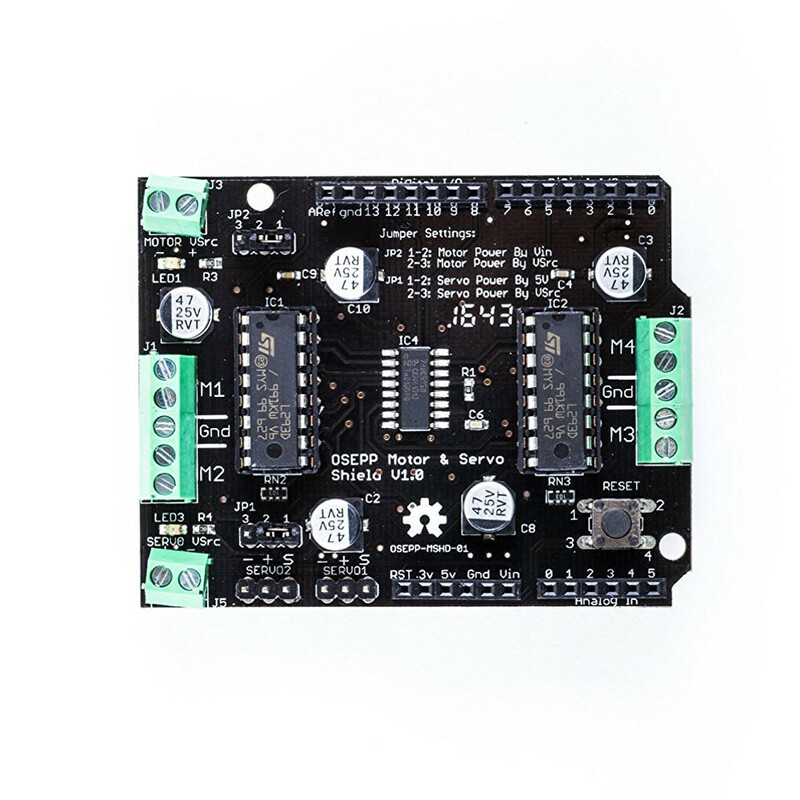 The servo power supply and motor power supply can be configured to source from an individual terminal block or from the Arduino board providing flexibility to your project. Provides connectors to support 2 servos. 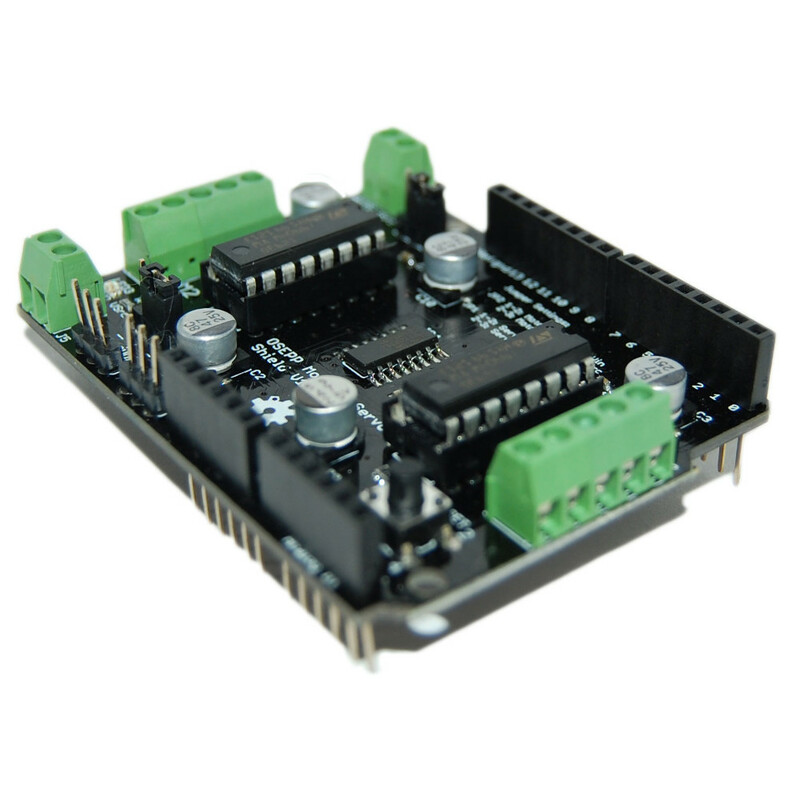 Servo power supply can be configured to source from the servo power terminal block or from the Arduino’s 5V pin. Support up to 4 bi-directional DC motors with individual 8-bit speed selection, and up to 2 stepper motors (unipolar or bipolar) with single coil, double coil or interleaved stepping. Motor power supply can be configured to source from the motor power terminal block or from the Arduino’s VIN pin. Support motors operating between 4.5V to 25V DC. Includes two L293D Quad H-Bridges chipset that can provide 0.6A per bridge (1.2A peak) with thermal shutdown protection, internal kickback protection diodes. Provides DIP sockets to support other pin compatible motor bridge chipset. Integrated pull down resistor to keep motor disable during start up. Individual LED indicator for motor power supply state and servo power supply state.